Speaking of her work, Nada Behr says “art is discovery…, color is happiness.” This philosophy is evident in her body of work, which makes marvelous use of bright, intense colors combined in a manner that reveals a detailed understanding of color theory. Her work makes use of both wet and dry techniques, showing technical finesse in her chosen media. Nada works vary in scale from miniature to medium scale, with themes of landscapes, flora, and rural scenes. Nada received her B.A. in Arts Education from Adelphi University. Her work has garnered recognition from the Eastern Watercolor Society of North Carolina, Twin Rivers Artist’s Association, Greenville Museum of Art, and signature membership in the Watercolor Society of North Carolina. Her work is included in numerous private business and collections throughout Eastern North Carolina and beyond. Marvin is an architect and artist. Born in central Missouri during WWII, Marvin has had a lifelong interest in expanding his world experience. That quest has taken him throughout Scandinavia (where he lived and worked in Copenhagen Denmark), Great Britain, Europe, Canada, and the United States. Marvin worked in New York City, Little Rock Arkansas, and Copenhagen, Denmark, before settling in New Bern, NC, in 1988. After fifty years in the architectural profession, Maune has retired and turned his focus toward creating artwork. 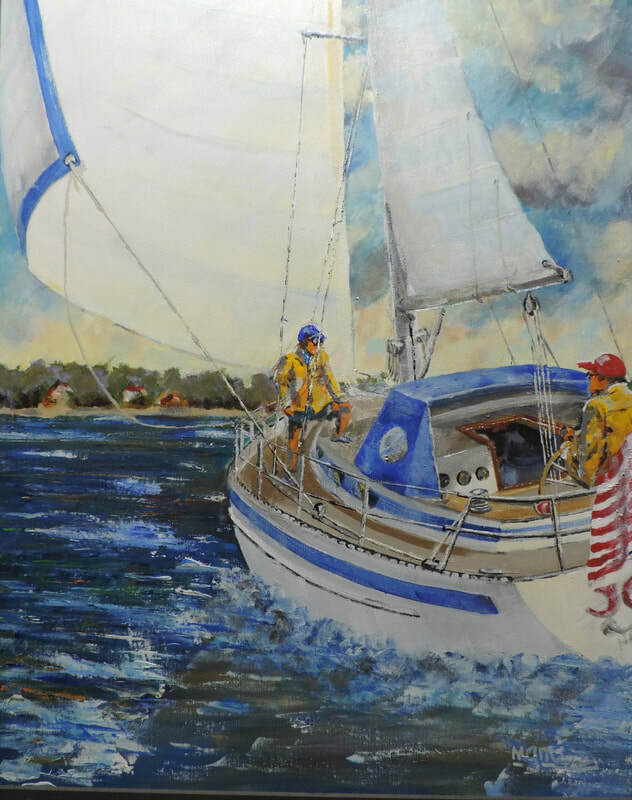 It was during his time in Denmark that Marvin developed a passionate interest in sailing, and the coastal environment, which influenced his decision to settle in New Bern. His work is focused on capturing the emotion, light, and feeling of a particular moment in time, a special place, or special experience. Although not always technically figurative, much of his work includes images of people, which gives his paintings a sense of scale and action, drawing the viewer into the message of the painting. Other examples of his work concentrate on the graphic composition found in still life subjects or details of building elements. The diversity of Maune’s subject matter reflects his interest in all aspects of human endeavor, and the man-made world we have created. Working in acrylics, oils, and watercolor, his goal is to develop images reflective of these diverse interests. He currently lives in New Bern, and his work has been exhibited locally at the Bank of the Arts and Carolina Creations, in national juried shows, and is found in many private collections. Patty moved to North Carolina from Ohio in 1986, when the manufacturing company where she worked moved their headquarters. Patty has a B.S. in Business and retired as Vice President, Controller. She has served on the Boards for National Association of Accountants and Interact (an organization working to end domestic and sexual violence). To escape from the black-and-white world of accounting where "creativity" is discouraged, Patty sought a release through working with silverplate. Her inspiration: to take something discarded, or no longer useable in its original form, and make it into something that is useful and beautiful.